V-moda Forza Metallo Wireless review | What Hi-Fi? For years, V-Moda has made headphones that could be called a more discerning listener's alternative to Beats. They generally deliver big bass, but with better balance and detail than Beats can usually muster. The V-Moda Forza Metallo Wireless Bluetooth in-ears are a little different, though. They are masters of refinement, a great choice for detail freaks willing to sacrifice some power and body in favour of outright clarity. The V-Moda Forza Metallo Wireless are among the smallest wireless earphones around. Their tiny earpieces are made of “aircraft grade” aluminium and, despite the size, they seem a lot stronger than the average plastic earphone. A couple of design choices explain this. These headphones use 5.8mm diameter drivers, far smaller than is average. Their battery and electronics are kept in the back of the neckband too, keeping any bulk hidden. This arrangement means the V-Moda Forza Metallo Wireless are among the more minimal-looking and attractive wireless earphones when worn. You should have no fit problems as long as you pick the right tips - there are also “sport fins” provided that attach to the earpieces, anchoring them in your ear. Noise isolation is strong too. That’s perfect for commuters wanting to nullify the background noise of public transport, but also means runners need to keep their wits about them when avoiding oncoming traffic. The part that rests around your neck is a slender, flexible neckband, at each end of which are little control modules. One is home to an on/off button, the other a three-button remote for changing tracks and volume. There’s no NFC, so you can’t simply wave a phone over the earphones to pair. But the V-Moda Forza Metallo Wireless do feature nano-coating for sweat-resistance, and have fast charging - this provides two hours of use from a 15-minute charge. V-Moda claims the battery lasts for over 10 hours, though in our tests we find the volume level needs to be wound higher than most, which impacts a little on battery life. One slight hardware fault concerns the V-Moda Forza Metallo Wireless' Bluetooth performance. The range is perfectly good, but they are prone to movement-related signal blips. Bose, Beats or Sony models are better in this respect. The V-Modas’ sound is characterised by some real highs - and a few lows that may make something like the Sennheiser Momentum In-ear Wireless or Bose SoundSport Wireless a viable alternative. Excellent clarity and upper-frequency detail is the main highlight. These earphones have an unusually clean and refined upper-midrange and treble, giving their sound a high-end character that’s rare in wireless headphones. This is delivered without harshness or any tiring granularity, making the V-Modas stand out quite clearly among mid-price wireless peers. The level of detail and high-frequency finesse makes the most of the reasonable soundstage width, packing it with spatial information. These earphones really reward close listening. Bass quality is good too. It’s balanced and controlled, and not as reserved as you might expect given the focus on detail and insight. The low-end is tight but rich, adding some fun to the sound and giving solid rhythmic drive. But it’s between the consummate upper frequencies and the excellent low end these earphones fall down a little. Their upper bass and lower midrange lacks both bulk and body. There’s a slight lack of substance here, and it leaves the Forza Metallo Wirelesses struggling to recreate more expansive or aggressive arrangements with enough power. It also affects lower-register male vocals. A lot of the texture of these sits right in the frequency zone the 5.8mm drivers struggle to cope with. You’ll still hear plenty of detail in the higher frequencies but others handle a baritone vocal, such as those of Johnny Cash or Leonard Cohen, with greater conviction. Detail junkies and clarity fiends will love the V-Moda Forza Metallo Wireless. They beat virtually all comers at the price in this respect. 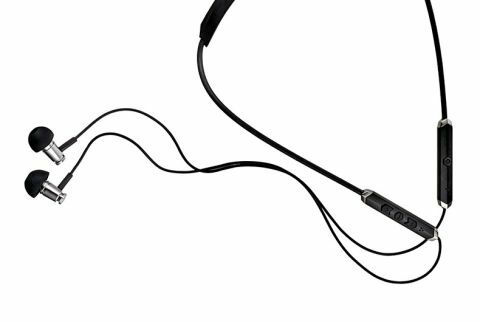 The small metal earpieces and a low-bulk neckband will appeal to many who don’t like the built-up look of some wireless headphones, too. But the lack of body in the lower midrange and upper bass frequencies limits the sense of power in their delivery, and ultimately costs them that final star.